Vote against Mormons? 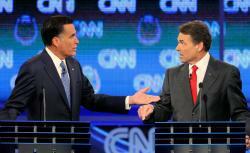 Mitt Romney asks, but Rick Perry doesn’t answer. Should voters prefer a “genuine” Christian to a Mormon? Perry hasn’t answered. With regards to the disparaging comments about my faith, I’ve heard worse, so I’m not going to lose sleep over that. What I actually found was most troubling in what the reverend said in the introduction was [that] he said in choosing our nominee we should inspect his religion, and [that] someone who is a good, moral person is not someone who we should select; instead, we should choose someone who subscribes to our religious belief. … And it was that principle, Governor, that I wanted you to [answer], “No, that’s wrong, Reverend Jeffress.” Instead of saying, as you did, “Boy, that introduction knocked the ball out of the park,” I’d have said, “Reverend Jeffress, you got that wrong. We should select people not based upon their faith. Romney is right. The problem with Jeffress isn’t what he said about Mormonism. It’s what he said about religion as a voting issue. That statement was made onstage at the Values Voter Summit right before Perry spoke. And Perry has never clearly addressed it. As Perry was speaking, Jeffress went out into a hallway and answered reporters’ questions about his remarks. That’s where everyone heard Jeffress call Mormonism a cult and say that Mormons weren’t Christians. His comments were recorded, posted (Slate’s David Weigel has a solid five-minute clip), and widely debated. Journalists, including me, latched onto the “cult” comment. The Perry campaign, asked for a response, initially said only that Perry “doesn’t judge what is in the heart and soul of others.” Later, the campaign said Perry “does not believe Mormonism is a cult,” but it ducked inquires as to whether Perry disavowed Jeffress’ comments more broadly. In retrospect, I’m sorry that I, along with rest of the press corps, got caught up in debating whether Mormons are Christians or whether Mormonism is a cult. Those questions don’t inherently matter. Jeffress has argued them in theological terms, and by his definitions, he’s correct. In fact, by his definition of “cult”—a human founder and scripture claiming further revelations—Christianity itself is, from a Jewish standpoint, a cult. Which means that anyone running for office is either a non-Christian or a cultist. Sounds pretty cultish to me. Perry wasn’t standing there when Jeffress delivered those words. Nor was he there when Jeffress called Mormonism a See You Last Tuesday. But Perry was standing offstage, basking in Jeffress’ praise, when the pastor, at the conference podium, urged the crowd to choose a “genuine follower of Jesus Christ” over a “good, moral person.” Even if Perry knew nothing about Jeffress’ past criticisms of Romney and Mormonism, he should have understood those words for what they were: a religious, not moral, test for public office. And he should have disowned them. To this day, he hasn’t. He has said he doesn’t judge what’s in another person’s heart. He has said Mormonism isn’t a cult. But Perry—who said less than a month ago that “as a Christian” he has “a clear directive to support Israel”—hasn’t addressed the underlying question posed by Jeffress and restated by Romney: Should Christian voters prefer a Christian candidate to a moral non-Christian? Let’s hear his answer.